Artist examining trauma travels more than 2,000 miles locked in a crate that couldn’t hold your refrigerator. Only a few days ago, artist Jordan Wayne Long was bolted inside a wooden crate and shipped from the small town of Bald Knob, Arkansas all the way to Portland, a nearly 2,250-mile journey that will require Long to spend a week locked in the box. “Shipped” is a bit of a misnomer, since the crate will actually be riding in the back of a cargo van driven by Long’s brother rather than at the bottom of a stack in the back of a semi truck (legal restrictions forced this decision), but he’ll be on the road, bolted inside the 35”x55”x55” box for seven days straight. He left his home state of Arkansas July 1 and will arrive at Fourteen30 Contemporary’s satellite gallery space at 937 NW Glisan for a show at 7:00 p.m. on Thursday, July 7. As he continued his study, Long commando-crawled his way through a reinforced tower of cardboard boxes, hitched himself behind a moving car on a leaf-strewn country road, and spent four days last spring locked in his crate in the common kitchen of the studio at Cranbrook. “I had no idea he was inside [the crate],” Cohen said. “All of the sudden someone came in with a ratchet and opened it. It smelled like a mule and he was just sitting in there playing the video game. It was really impressive.” Cohen encouraged Long to take his crate on the road and helped him set up Thursday’s showing with Fourteen30. This past May, Long completed his MFA and then spent a month doing landscaping work in Boston to save up for his trip. 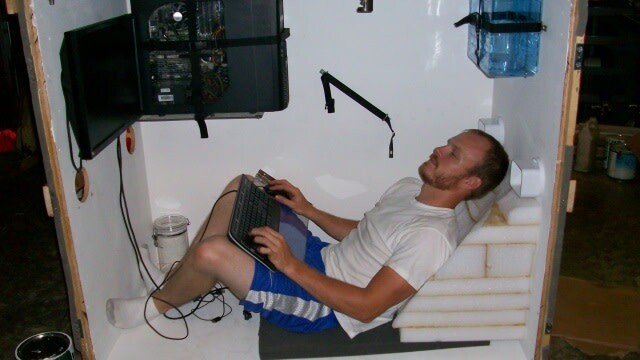 In the crate, Long will live on only protein bars and water, relieve himself in “two custom air-sealed containment units,” and his only connection to the outside world will be playing Lord of the Rings Online, a computer game. According to Long’s gear list , he’s bringing as much computer equipment as anything else. Recent research suggesting gameplay might reduce the effect of post-traumatic stress disorder, as well as a Pentagon project experimenting with online games, has encouraged Long to include gameplay in this weeklong personal study of isolation and trauma, exploring connections between managing social environments in online gaming and dealing with trauma and stress in the real world. Long’s work, especially his current project, carries echoes of ‘60s and ‘70s performance/body artists like Chris Burden and Vito Acconci. Burden’s Five Day Locker Piece, in which the artist spent five days in a 2’x2’x3’ locker on campus at UC-Irvine with five gallons of water in the locker above him and an empty five-gallon container in the locker below him, is the most directly analogous. But Seedbed, in which Acconci spent eight hours a day for three weeks in New York’s Sonnabend Gallery masturbating and speaking his sexual fantasies into a microphone while attendees walked above him on a ramp, might also be an interesting direction for Long to travel. Both Burden and Acconci went on to create enormously diverse bodies of work, something Long seems poised to do as well. There’s something a bit boyish and brash in a few of the samples of Long’s work I’ve seen so far, and Drag (above) looks like it’s taken directly from the Johnny Knoxville oeuvre (with the exception, perhaps, of the final scene). Long may still be searching for the right angle to approach a topic as multifarious as trauma and PTSD, but it is apparent from speaking with him that his work is evolving and that he’s an artist to watch. For Box Shipment #2, the question that remains is how Long will make use of the trauma discussion when he arrives at the gallery in Portland. Tonight, he’ll be delivered in his crate to Fourteen30’s 937 NW Glisan space, where after a week of being practically immobilized he’ll lift himself up using a homemade pulley system while still locked inside.